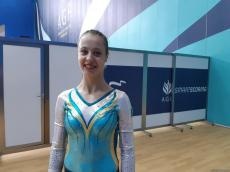 Kazakh gymnast Yekaterina Chuikina, participating in the FIG Artistic Gymnastics Individual Apparatus World Cup, sees her performance at the competition as being satisfactory, the athlete told Trend. “My performance was satisfactory. I am pleased with it regarding certain things, and not so regarding others. There were some minor flops. It was probably the excitement. You need to prepare both mentally and physically,” she added. The gymnast arrived in the capital of Azerbaijan for the first time, and, according to her, the city made a very positive impression on her. "It is my first time in Baku, and I am beyond impressed. The competitions are decent - held at the highest level. The hall is beautiful, the competition is good. I like it in Baku, We are greeted very warmly here. I have not yet had time to take a walk around the city, but am planning to," she said. Gymnasts Murad Agarzayev, Ivan Tikhonov, Nikita Simonov and Marina Nekrasova represent Azerbaijan at the FIG Artistic Gymnastics Individual Apparatus World Cup.